The Colbert County Jail was built in 1962 to house 62 prisoners. Male prisoners are housed at the Colbert County Jail. Female prisoners are housed at the Tuscumbia City Jail. 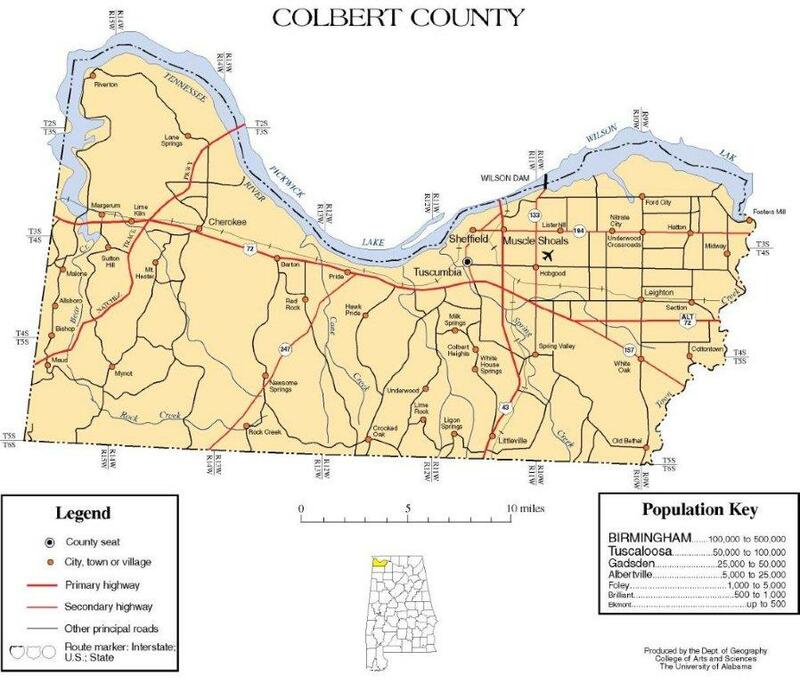 Once an inmate is booked into the Colbert County Jail, they are placed directly into the general population. The inmate is allowed to receive the items listed below within the first 72 hours after being booked into the jail. All items brought in must be new, unopened, and in original packaging. If it is not listed below, it will not be accepted. All items brought for inmates MUST be solid white. These items may be brought to the jail Monday thru Friday, between 8 a.m. and 4:30 p.m. All items will be searched before the individual bringing them is allowed to leave. If the individual bringing the items refuses to allow a search of the items while they are still here, the items will not be accepted and the person will be asked to leave. Once the 72 hours has passed the inmate will have to order all items from the commissary. No items will be brought in during visitation on Sundays which is from 1:30 p.m. to 4:00 p.m. each Sunday afternoon. Kimble's Commissary Services provides the inmate commissary needs. During the booking process an account is set up for each inmate. If an inmate has money in their possession during the booking process, the money will be taken and placed into their inmate commissary account. Money can be added to the inmate’s commissary account and you can write personal emails to our inmates if you go to the online link: http://www.jailatm.com or you may come to the jail any day of the week from 7am until 7pm and add funds to the inmate kiosk machine in the jail lobby with CASH, DEBIT CARDS or CREDIT CARDS. When ordering commissary, inmates have the option to order snacks, drinks, personal hygiene items, stationary items including stamped envelopes and some clothing items. Inmates place commissary orders once a week on Tuesdays, and receive their orders on Wednesdays. When an inmate is released they will be issued a Master Card debit card for the remaining balance of their account. However, if the inmate is transferred to another jail facility of another agency they will be issued a check to take with them to that facility. Or you may come to the jail any day of the week from 7am till 7pm and add funds to the inmate kiosk machine in the jail lobby with CASH, DEBIT CARDS or CREDIT CARDS. Visitation hours are Sunday from 1:30 p.m. to 4:00 p.m. Inmates are allowed fifteen (15) minute visits. If an inmate or entire inmate section is locked down, inmate visitation may be denied. The booking process can take a while, therefore, new inmates being booked into the jail will not be allowed visitation until the booking process is completed and the inmate is placed in his or her cell. Also, make sure inmate mail includes the sender's name and return address. Any inmate mail received without the sender's information may be destroyed. Also, we do not forward inmate mail to other facilities should they receive something after being transferred. Cash Bond- (ONLY MONDAY - FRIDAY 8am - 4pm) Come to the jail and ask for a CASH BOND to be prepared. The jailers will prepare you a cash bond and have the inmate sign it. Then you will take this signed cash bond (and a $35 money order for the court fee) to the clerk’s office, on the 2nd floor of the courthouse. Then bring a copy of the receipt they give you to the jail and your bonding process will be complete. Property Bond- If you have a property assessment printout from the Revenue Commissioners office, bring the property assessment printout to the jail for review. If you do not have this printout it may be possible for our jailers to look up your property value on our computers. Property must be valued at least as much as the total amount of the bond or greater. More than one piece of property can be used to make a bond, in which case the property values will be added together. All people listed as owners on the property assessment must be present to sign the bond. ALL bonds require a $35.00 bond-filing fee in the form of a money order. The money order should be made out to the Colbert County Circuit Clerk and can be paid at the clerks office on the 2nd floor of the Colbert County Court House, within three (3) working days of the date of the bond. (NO cash or personal checks will be accepted). For questions concerning bonds, contact the Jail at 256-386-8551.